Disclaimer: The Qigong Institute makes no suggestions, claims, or recommendations regarding any medical therapy, treatments, exercise program, or medical practitioners. For medical advice or before embarking on any exercise program, we recommend that members of the public consult with a qualified physician. A Qigong "form" can be a single movement repeated a number of times, or it could be a short to very long sequence of movements, as in Tai Chi or Wild Goose Qigong. Click image to watch video. These Qigong forms are often practiced much slower than shown. The movements range in difficulty from easy (flowing motion) to more complex (tuoa and drawing the daoist symbol). The most complex forms of qigong consist of a combination or sequence of many different movements (as opposed to the same movement repeated multiple times) and take many minutes (e.g. ten to fifteen) to complete once. An example of complex Qigong form practice would be Wild Goose Qigong. One of the easiest forms of Qigong is Flowing Motion, from Enhance Vitality Method, shown in the DVD Qigong Chi Kung by Dr. Roger Jahnke. Breathe in as you go up and out as you go down. For more exercise, go up onto your toes. The Rolling the Ball movement is used to feel the qi between your hands and get out of your normal way of thinking. Imagine you have a ball between your hands and you can move it anywhere, but your hands cannot move through the imagined ball, just like they couldn't go through a real ball. Many different types of Qigong have a movement like Rolling the Ball. A little more energetic movement is Inner Rivers Flowing which is described in The Healing Promise of Qi: Creating Extraordinary Wellness Through Qigong and Tai Chi. A fun Qigong form similar to Inner Rivers Flowing is calledPush and Pick Up the Wheelfrom the DVD Creating Flexibility through Qigong by Medical Qigong Master Dr. Bingkun Hu. This one is called Flying Wild Goose, and comes from a form of Qigong called Tai Chi Qigong. There are hundreds of different versions of Wave Hands in Clouds. This movement is usually done as part of a much longer T'ai Chi form, but it can also be done by itself. T'ai Chi is a moving form of Qigong. The Double Helix movement has its origin in Hua Shan Qigong and can be found in the DVD Creating Flexibility through Qigong by Medical Qigong Master Bingkun Hu. See if you can discover the figure-8 pattern (infinity symbol) made by the arcs described by your hands. When the hands pass each other, palms are facing so that energy flows between the Lao Gong points (Pericardium 8 acupuncture point) located roughly in the middle of each palm. A little more challenging practice is called Rejuvination, from the DVD Creating Flexibility through Qigong by Medical Qigong Master Bingkun Hu. Be sure that your arms describe circles both in front and in back of your body as you go through the range of motion. Tuoa is the signature move from Wuji Hundun Qigong, featured in the PBS Qigong documentary "Ancient Chinese Healing for the 21st Century" (Click to preview the documentary). Traditionally, rocks were held in the hands to make sure that the palms were facing up throughout the range of motion. Imagine you are a waiter carrying a tray with a glass on it, and the glass cannot fall. See if you can spot where the two-armed pattern changes. There are at least two more remaining variations on arm movement patterns that are not shown. This is a very challenging but rewarding form called Drawing the Daoist Symbol from the DVD Creating Flexibility through Qigong by Medical Qigong Master Bingkun Hu. Initially created for use in a Taiji intervention study at the University of Illinois, Elixir: Music for Moving and Still Meditation is a music CD for moving and still meditation practices. This CD is unique in that it was composed and performed in entirety by both a master traditional Chinese musician and longtime practitioner of qigong meditation. For more information, visit www.yangying-music.com . The Da Yan Wild Goose Qigong is an acient cultivation practise originating from the Jin Dynasty about 1700 hundred years ago. The movements represent the flight of Wild Geese and help to expel toxins from the body, cleanse the meridians, improve blood flow and draw in and circulate fresh Qi. The first 64 Movement set deals primarily with the "post natal” body and addresses illnesses or injuries that have developed as a result of everyday life. Having dredged the channels in the first 64 form, the second 64 movement set deals primary with the “pre natal” body and is designed to clear the channels, absorb fresh Qi, expel stale Qi and restore organ balance. Much of the benefit of Qigong ear massage is due to the stimulation of the vagus nerve. These are some very basic Qi Gong exercises which can be used either to maintain health if you are new to Qi Gong or as a foundation upon which to build your Nei Gong practice. This is a video of some practices from the book Daoist Nei Gong: The Philosophical Art of Change by Damo Mitchell. Spinal Spiral energy practice. Chan Mi Gong is one of many Qigong forms that emphasize spinal movements for health and wellbeing. Karl Romain's Best Qigong and Tai Chi Exercises. Watch as Karl Romain, a world champion kung fu master, shares qigong and tai chi exercises for a better well-being. The Wandering Warrier Column - 'Qigong' By Jill Roth. (PDF) in Mindset Self-Defense Magazine Febuary 2015. An interview with Qigong and Tai Chi Teacher Bina Bou as well as an introduction to Qigong and a description of Qigong practice during one of Bina's classes. Wuji Swimming Dragon is a very simple and easy to learn yet powerful form of Qigong. There are many other versions of Swimming Dragon besides Wuji. A characteristic of Swimming Dragon Qigong forms is that the body is continually moving or flowing and exercising some or all joints while describing a form such as a Figure-8 or infinity symbol as in Animal Frolics Swimming Dragon . The Wuji Swimming Dragon video was created by Francesco Garripoli, the Chairman of the Board of the Qigong Institute. It is part of a longer DVD. See the Qigong Store for how to purchase this and other Qigong DVDs. Some gentle flowing Qigong warm-ups, including several forms (Swimming Dragon and Tuoa) in common with Wuji Hundun Qigong. The following short video [Part 3 of 5] features some easy and gentle beginning Qigong exercises led by Dr. Adeline Ge in an educational video presented by the National Center for Complementary and Integrative Health. Also see [Part 4 of 5]. [video length: 1:18:43] In China, the way to vibrant health does not lead to the doctor's office; it is as close as the air we breathe. In Qigong: Traditional Chinese Exercises for Healing Body, Mind, and Spirit, you will learn ancient techniques for harnessing the massive power of qi — literally, the "vital breath" or energy of the universe. Thousands of years before the establishment of Western medicine, Chinese masters perfected a system of gentle movements and meditative postures that can channel qi into the body for detoxifying, energizing, and healing. 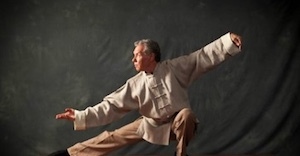 Ken Cohen, preeminent qigong master in the West, presents authentic practices on qigong. 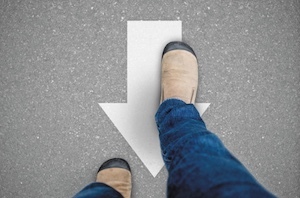 Using easy-to-follow language and dozens of demonstrations, Cohen shares a complete four-part workout you can practice any time you have a few minutes and enough room to stand and stretch. Some very beautiful, gentle, flowing Qigong done by an impressive number of people. There are many different versions of "classic" Qigong forms. The following are just a few of them. Classic Qigong forms have been practiced for centuries or millennia. Develop Qi Sensitivity and Restore Balance to the “Three Jiaos” with a Powerful Exercise from Master Hua Tou (.PDF). This simple practice example is taken from the Crane form of Hua Tou’s Five Animal Frolics, one of the oldest and most revered forms of Qigong. Hua Tou was a famous physician during the Eastern Han Dynasty (circa 200 CE.). He is famous in the history of Traditional Chinese Medicine as the first doctor to successfully practice abdominal surgery and for creating the Five Animal Frolics. The Five Animal Frolics are movements designed to mimic the energies and strengths of five different animals: the crane, bear, tiger, monkey, and snake. The five animals also correspond to the five elemental energies as well as the five seasons, with the fifth season being late summer. According to Traditional Chinese Medicine history, the Qigong exercises developed by Hua Tou have been proven to be some of the most effective for restoring health and promoting vitality. The book of Chaung Tze (also spelled Zhaungzi, which dates to at least the 300's BCE) mentions the benefits of mimicing the physical movements of certain animals, so the practices attributed to Hua Tou likely arose much earlier. Animal Frolics Qigong - IIQTC (video 54:16). These are more vigorous Qigong forms. The five animals in the exercises are the bear, tiger, monkey, deer, and crane. They are said to improve functioning of the lung (tiger), kidney (bear), liver (deer), heart (crane), and stomach (monkey), respectively. Mawangdui Daoyin Shu: Qigong from the Mawangdui Silk Paintings (Chinese Health Qigong) . Some of the earliest known images of Qigong exercises were found on a colored silk painting unearthed at Mawangdui Tomb in the early 1970's that date to the Han Dynasty (206BCE - 220CE). The 44 people are shown doing dao yin, postures and movements combined with breathing and physical exercise for health maintenance and treating illness. The forms can be done by themselves or in a particular sequence, as shown in the following videos. To get the most out of the practice, learn it from a teacher. Since one probably won't be available where you live, buy the book because it has some important details that are not obvious from watching and studying the videos. And as with all Qigong, practice the Three Intentful Corrections. Five basic health internal exercises from the Daoist tradition of Qigong Practice. The video demonstrates some very simple yet powerful Qigong movements. Shaolin Luohan Style Qi Gong (Shi San Shi Luohan) is a set of 13 postures/movements that was developed by Shaolin Monks, after contemplating and imitating different forms and expressions of Luohan (Arhat) statues in the monastery. It belongs to the classic repertoire of Qi Gong exercises in the Shaolin Arts around the globe. In comparison to the 8 brocades (Ba Duan Jin), the Muscle and Tendon Transformation Excercises (Yi Jin Jing) and the meditative circular movements (Chan Yuan Gong), the movements in this set can also practically be applied for martial application. Together with the other Qi Gong sets, this routine develops a strong foundation to remain powerfully calm and aware. Qigong can be practiced many ways, including sitting, standing, moving, or lying down. This 20 minute video was created by Bill Douglas, founder of World Tai Chi and Qigong Day, as an easy to follow example of Sitting Qigong for relaxing and reducing stress.